VICTORIA – The University of Victoria Vikes men’s soccer team and head coach Bruce Wilson are pleased to announce the commitment of 17-year-old forward Rees Goertzen for the 2017-18 season. The Calgary, Alta. native will join the Vikes after graduation from Mount Douglas Secondary School, where he has played right across the road from UVic for the last year. 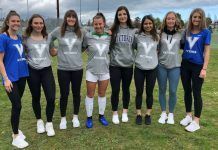 A former member of the Whitecaps Residency Program, the six-foot-two Goertzen will be looked upon to provide a scoring punch for the Vikes in years to come. “Rees is a very good prospect, he is a good size and extremely fit,” said Vikes head coach Bruce Wilson. “We look forward to him coming to UVic next year and I think down the road he will be a big impact player for us. Originally from Calgary, Goertzen starred in his home province before making his way to the West Coast. A member of both the Calgary Foothills SC and Team Alberta from 2012-2015, Goertzen made a huge impact on the national level in 2014. Winning the Golden Boot as the top-scorer at the 2014 National Championship, he helped his team to a bronze medal finish. Goertzen spent the past season with the Vancouver Island Wave, where he played under the tutelage of Vike alumnus Dave Ravenhill and Blair Sturrock. The prospective Bachelor of Arts major is excited about the opportunity to attend university so close to his new home.